Burnout 3: Takedown brought the magic of crash mode to gamers everywhere in 2004. It was unceremoniously stripped away in Burnout Paradise and hasn’t been seen again until now. 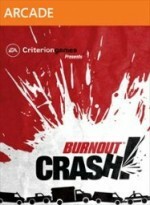 As if to make up for the absence, Burnout Crash is all crash mode. However, it doesn’t work like you remember. This downloadable title trades a high-fidelity street view for a cartoony top-down camera angle. I miss the traditional presentation, but I can see why this decision was made. In every stage, you drive onto the map and bash into the first car you see. You then trigger Crashbreakers to blow up everything nearby and send your vehicle flying. You can use the analog stick to steer your flaming mass of metal into the path of oncoming traffic, slam into valuable buildings, or do whatever you please. The presentation bombards you with stimuli similar to a pinball machine. Slot machine noises, explosions, score tallies, the theme song from Cops, immediately annoying voiceovers (like southern guy and surfer dude stereotypes), and more constantly punctuate the experience. All the while, Crash teeters back and forth between exciting and obnoxious. Crash contains 18 different junctions set in locales like a sunny California beach to a take on the alien-themed Roswell, New Mexico. Each stop contains three challenges to earn high scores and stars on (the latter unlocks new vehicles). Road Trip tasks you to keep the crashes going without letting more than five cars escape unscathed. If you survive, a stage-ending Super Feature like a tornado or giant asteroid wreaks havoc across the land. Rush Hour gives you 90 seconds to do the most damage, and Pile Up offers a limited amount of cars to crash. Despite these slight tweaks to the rules, the modes don’t feel all that different. After the initial hour or so, I started to feel the repetition setting in. You play the same intersection three times in a row, move on to the next one, play that three times, and so on. It really starts to feel like a grind as you try to plow through all the levels. Autolog helps turn that around by constantly pitting your scores against your friends’ in a manner similar to Pinball FX 2. Crash works much better in smaller bursts as you reclaim the leaderboards and accept and offer official challenges. If you’ve got a lot of friends to compete against, Crash has a good amount of life in it. Otherwise, single-player doesn’t take long to dry up. hasn’t been seen again until now.